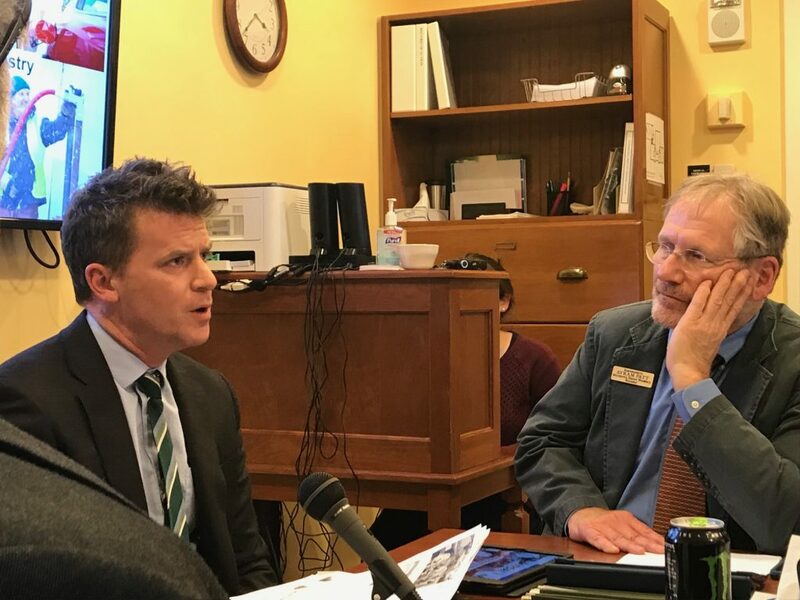 VERMONT STILL NEEDS FUEL: Vermont Fuel Dealers Association Executive Director Matt Cota, left, explains to the House Energy and Technology Committee that Vermonters need fuel for years to come. MONTPELIER — Two leading energy policy professionals spoke before the House Energy and Technology on Tuesday to analyze a state-funded decarbonization study that downplayed the potential cost of global warming policies. Peter Walke, deputy secretary for the Agency of Natural Resources, spoke on how carbon-cost-setting incentives could be implemented. Matt Cota, executive director of the Vermont Fuel Dealers Association, discussed why Vermont needs conventional fuels for the foreseeable future. Walke, who chaired Gov. Phil Scott’s Vermont Climate Action Commission — and also is lead negotiator on the Transportation Climate Initiative, a multi-state cap and trade deal — focused his remarks on changes to the transportation and home energy sectors, which account for 45 and 28 percent of carbon emissions, respectively. “We know fundamentally that our economy across the globe is going to transition to reduce our fossil fuel use and look to other sources of energy and simply different ways of thinking about things,” he said. 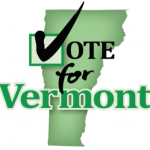 At the state level, Vermont’s governor has included $1.5 million in EV purchase incentives. He also has a proposal to use some of the $18 million from the Volkswagen settlement to pay for more EV charging stations. The vehicles carry certain risks for Vermonters, however. In particular, electric vehicles don’t perform well in cold and snowy climates like Vermont, and no automaker has produced a four-wheel drive EV model. Other aspects of the decarbonization study discussed with committee members were carbon taxes and cap-and-trade schemes. “You control one variable in each system — In cap and trade you control the emissions, which is the outcome you want, and the price fluctuates. For a tax, you control the price and the emissions fluctuate,” Walke said. He added that a cost to carbon tends not to be enough to change people’s energy and transportation habits. Rep. Mark Higley, R-Lowell, suggested all these programs together could prove overwhelming. “My concern is, looking at this from an overall perspective, how do you envision making sure that this is looked at in its totality rather than piece by piece? It could be devastating to the economy,” he said. Walke replied that for any of these programs to work politically, they must not devastate the economy. Cota started his testimony by acknowledging that the 2011 Vermont Comprehensive Energy Plan seeks to “virtually eliminate” the use of petroleum. He said the workers he represents as leader of the Vermont Fuel Dealers Association are adamantly against that aim, but he also sees opportunities for the industry to diversify. He reminded lawmakers that conventional fuels still play an essential role. For example, EVs aren’t expected to pass 2 percent of market share even by 2025, meaning gasoline vehicles will continue to dominate Vermont roads. He also told lawmakers that petroleum is what got all of New England through a memorable 15-day stretch of subzero temperatures in 2018, even as electric heat pumps froze and natural gas supplies dwindled. He also disputed some of the key points from the decarbonization study, starting with the notion that raising the cost of carbon-based fuels is going to automatically reduce particulate matter emissions. Cota said another mistake in the report is that sulfur dioxide emissions will significantly be reduced. He said the fuel industry has already adopted into low-sulfur mixes of their fuels, while the calculations in the study seemed to assume the higher-sulfur versions. up to 50’s in the winter which will make electric cars viable in this now too cold clime. Massachusetts had an electric school bus program financed with Volkswagen money. After a year, it was found the $350,000 buses did not reduce energy costs. Just google to get the report. That is what happens when naive bureaucrats and legislators with agendas run the show. The VTDPS survey found energy savings were just $200 per year per heat pump. Climate change, a cooling climate, brought us the pending ice age panic of the seventies. I do not recall a suggested increase in carbon emissions as a solution. NASA temperature averages indicate a cooling trend for the past two years and indicate we may have another year of lower temperatures. If this trend continues, will the AGW cabal promote increased carbon emissions to prevent the climate from changing? I recall Climate Emperor Gore saying British children would only know what snow looked like from pictures in books. I just read that meteorologists have just come to the conclusion that tornadoes start near ground level. I learned that in eighth grade science class a half century ago. How much carbon did California contribute to the atmosphere by not clearing dead trees, deadfall and brush in their forests, by not permitting a system of access roads and firebreaks? In past interglacial periods the Polar regions have become ice free (without human help). The AGW Cardinals of Climate (most of whom far exceed the carbon emissions of the rest of us) are going to prevent it this time – by the age old rituals of sacrifice imposed upon the commons (and purchasable indulgences for sinners) ? I don’t accept their “Settled Science” – I want to see the one-on-one point-by-point debate in defense of their position – which they vehemently refuse to do. Refusal of debate tells me they fear their argument doesn’t bear rational scrutiny. Pretty sure Tesla has for years. Let’s at least be factual. Actually, unless one of their high end cars had that option, the Model 3 just started offering it this year. Cost is $45K+ after rebates. Plus face it, none of the Teslas are exactly suitable for families or tradesmen on the road. The 2019 Honda plug-in and non plug-in hybrids will have an additional electric motor to provide 4-wheel drive, as an option. They still get at least 50 mpg, EPA Combined. Tesla has become the largest EV mfr in the world, except for Some of China’s companies. Point being the statement was false, and unless this guy lives in a cave it’s pretty common knowledge. Making a statement like that just makes it out that’s he’ll say anything to attempt to get his point across. Lets face it, Tesla’s are fun cars to drive. You step on the “gas” and it’s pretty awesome. Perhaps Mr. Walker would like to tell us how his State of Vermont Chevy Volt performed on his way to Bennington last Monday, since he never made it to Bennington.